Change is good, and this is no exception. 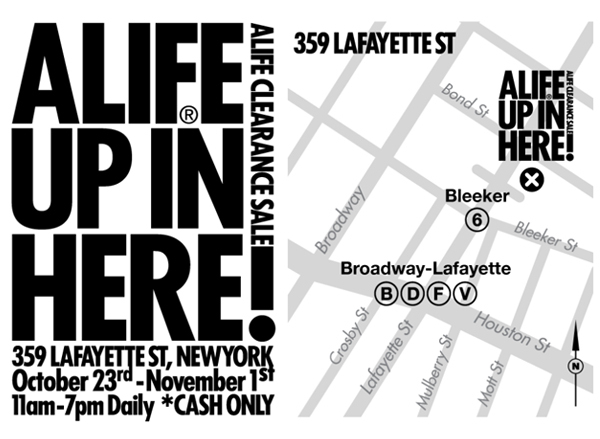 ALIFE is moving warehouses and, rather than transport previous season goods to our new facility, we have decided to take over 359 Lafayette Street for 10 days and clear the goods at deeply discounted retail prices. A wide assortment of T-shirts, sweatshirts, headwear, footwear and accessories from the past 6 seasons will be on sale with discounts ranging from 50-80% off. New York, NY, 10012 October 23rd – November 1st.